Crawl space repair will create a healthier living space, eliminate harmful allergens and save money on your utility bills. Plus, encapsulating your crawl space with a vapor barrier adds useful storage space to your home! We offer free crawl space repair quotes in the Pennsylvania and New Jersey area, including areas like Levittown. To survive, mold needs three things: some warmth, organic materials to eat, and a relative humidity of 60% or higher. Mold is very tolerant to heat and cold — it grows in refrigerators, and it will certainly survive in your crawl space. Mold can also survive by eating just about any organic material, including wood, fiberglass resins and paper backings, cardboard, dust, and organic materials in soils. However, mold has one important weakness: it needs lots of humidity to survive. BQ Basement Systems can eliminate mold growth by sealing off the crawl space vents, installing a plastic vapor barrier on the walls and floor, and running a dehumidifier in the space. We stop the problem by eliminating what helps mold grow! Call today to schedule your no cost, no obligation estimate for your dry, mold-free crawl space! This dirt crawl space was in poor condition when the BQ Basement Systems experts first got a look at it. They came up with a plan to tightly seal the space with our CleanSpace Encapsulation System. CleanSpace is a thick white liner that keeps out moisture, pests, and humidity. In addition to the barrier, a sump pump was also put in place. This will collect any water that may accumulate, and expell it from the basement, out of the space and away from the homes foundation. A dark crawl space in Hatboro, PA that was changed into a dry and bright space. This Pennslyvannia crawl space was completely uninsulated, exposed to moisture and pests. BQ Basement Systems came in and installed our CleanSpace Vapor Barrier Liner, that keeps out not only moisture and pests, but also humidity. This installed improved the health of the crawl space, thus improving the overall health of the home. This Merion, PA Crawl Space had a humidity issue. After consulting with BQ Basement Systems, the homeowner agreed that the best course of action would be to have our Clean Space Vapor Barrier installed. This liner keeps out moisture, pests, and most importantly in this case- humidity. To double combat the humidity problem, a dehumidifier was also installed. If you have a wet, leaking crawl space, it will affect your entire home. The best way to dry a flooded crawl space is to install a crawl space sump pump and crawl space drainage system, to collect the water and discharge it from your home through a discharge line. 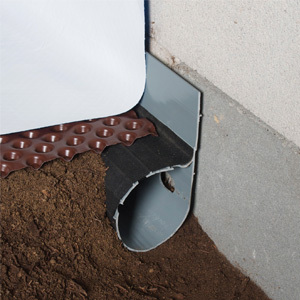 At BQ Basement Systems, we also recommend installing SmartPipe™, the first custom-engineered crawl space drainage system designed just for crawl spaces. SmartPipe™ is specially designed to collect crawl space groundwater and direct it to the sump pump system. Once your crawl space drain has been installed, it's a good idea to protect your home further with a crawl space vapor barrier, along with airtight crawl space vent covers and doors. At BQ Basement Systems, we provide the CleanSpace® Crawl Space Encapsulation system, including our 20-mil thick crawl space liner which carries a 25-Year Warranty. I was 100% satisfied with the work done. The crew was great, Mike was courteous, professional, and very nice. The office staff was really great and Dianna was always very helpful and friendly. The salesman was really great, he did not try to sell me on stuff I didn't need or want. The clean up was great. I heard about BQ through a friend and also through many advertisements. I am really pleased with the staff and the results. I was very much satisfied with the work done. The crew was very professional, clean and accommodating. The office staff was great, Dianna was excellent. The salesman was THE BEST, he was not pushy at all, very professional. He was honest. He wanted to do the job because we needed it. It was a WONDERFUL JOB! We heard about BQ Basement Systems from a previous customer. We're very satisfied with the job they did in our crawl space. The crew was excellent, the salesman was professional and thorough. Tom and Chris were very good, great job! At BQ Basement Systems we use and recommend products developed by the Basement Systems® International network of waterproofing contractors. In business since 1987, Basement Systems® operates a full Research and Development department, constantly searching the industry for the best, most proven products for lasting crawl space solutions.